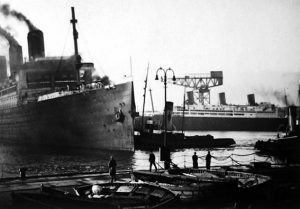 Early in January 1937 there were rumours that Leviathan, laid up since September 1934, was to be converted into a troopship, but neither the US Army or Navy were seriously interested. In October 1937 formal calls were made for bids from scrapyards, although some rather onerous conditions were included. Only two bids were submitted: the winning bid of $800,000 was made by two British companies, Ward’s and Metal Industries. They planned to scrap her at Rosyth in Scotland, an area of high unemployment, to provide work for up to 400 men. The final amount paid was $732,000, well below the $2.5 million US Lines had expected. On 13th December 1937 workers from Bethlehem Steel came aboard to prepare the engines, boilers and other machinery for her final trip, to be made under her own power. On 17th December 1,500 tons of fuel oil was pumped aboard. The skeleton crew from US Lines left on 28th December, and the US flag was finally lowered. A UK firm had hired a crew of 150 to handle Leviathan on the trip to Rosyth, and they sailed for New York aboard Berengaria. Captain John W. Binks was brought out of retirement for the crossing: he had previously commanded both Majestic and Olympic, and was used to handling such big vessels. 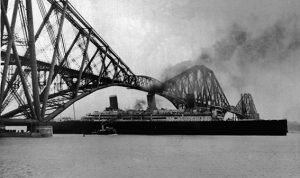 On 10th January 1938 the funnels were shortened by 10 feet and the masts by 30 feet, so she could pass under the Forth Bridge. Lifeboats were taken down, furniture was roped together and carpets rolled up. The initial plan was for Leviathan to sail on 21st January, to arrive at Rosyth on 3rd February. The engines and boilers were tested and approved, but then the British seamen went on strike when they realised some American sailors on board were receiving a higher level of pay! Captain Binks arrived on board on 19th January, with three supporting officers, but with the strike, they weren’t able to sail. Sailing was delayed several times as the strikers demanded wage parity, then a bonus, but finally a settlement was reached. On 25th January the tugs arrived to assist Leviathan from her berth; later that day more fuel was loaded, and final preparations made. 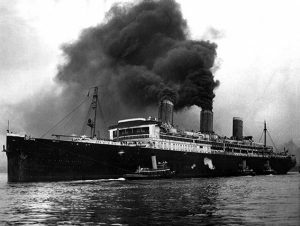 Eventually, on 26th January she left New York, sailing under the Red Ensign rather than the US flag, under a huge cloud of black smoke. After 3,164 miles, at an average 17.1 knots, Leviathan arrived off Scotland on 3rd February, but missed the spring tide and had to wait nine days for the next. On her first attempt to enter the Firth of Forth, she grounded in a strong gale, and had to be towed off. On 14th February another attempt was made, and she finally made it into the Admiralty Basin, opposite her sister, HMS Caledonia (ex-Majestic). Scrapping did not proceed very quickly, and finally in August 1939 the Admiralty ordered Metal Industries to clear the yard: with the deteriorating situation in Europe they realised they would soon be needing the facilities. 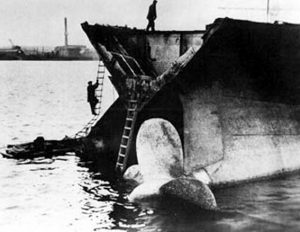 The remains were towed out of the basin and beached. Scrapping was not complete until 14th February 1940.